Very private 2.5 Acres MOL. The perfect setup for weekend boating, fishing, hunting. Dream location, central and convenient to everywhere in Citrus County. All New in 2012: well pump, 2 car carport/shed, paint. 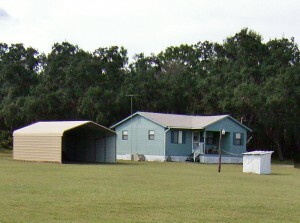 Extra tall shed will accommodate RV or Airboat. Sweet deal. Directions: Hwy 44 turn onto Homosassa Trail (490), R on Rock Crusher Rd, L on Homeland Ct. House is setback from the road.